Users with Billing and Invoice permissions enabled can add notes to an invoice or edit an invoice's billing address. Changes can only be made to Current or Closed/Unpaid invoices. 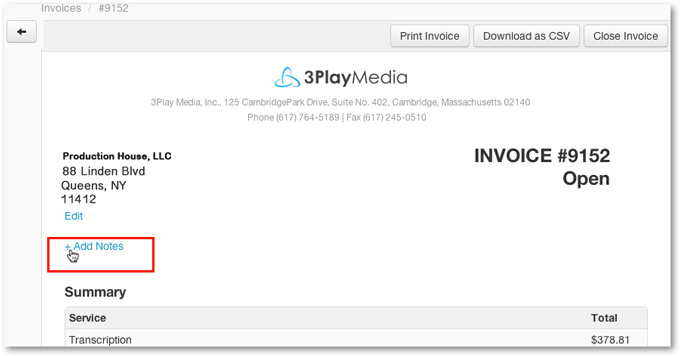 After modifying an invoice click Re-Send Invoice to email an updated version of the invoice to all billing contacts. PLEASE NOTE: Saving the address within an invoice will only change the address within that particular invoice. To change the address for all other invoices going forward the Billing Address associated with your account will need to be updated. See more information on updating your billing address. Click Billing located in the top, right-hand corner of the page. Click the ID # of the invoice you want to add a note to or to amend this invoice's associated billing address. Click Edit located below your address. Once a new address has been entered click Update to save the change to this invoice. Notes can be included in your invoice. Click +Add Notes located under billing address information. After entering your note click Save Notes. Once you have made a change to an invoice, click Re-send Invoice located on the top, right-hand corner of your invoice to send the updated invoice to all users in the account or project with billing and invoice permissions enabled. Once you have clicked Re-Send Invoice navigate to your account Invoices page by clicking on the arrow on the top, left-hand corner of the invoice.